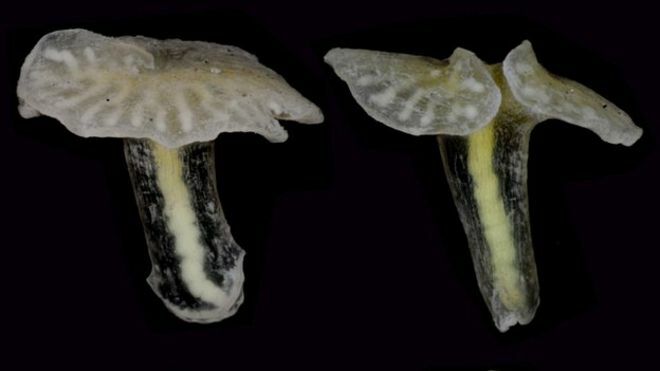 The origin of the deep-sea mushroom, an unusual gelatinous creature first dredged up near Tasmania in 1986, has been described for the first time. Australian scientists have used genetic material to pinpoint the origin of the organisms that have a cylindrical stalk covered by a flat, semi transparent disc. The disc houses visible channels that branch outwards and resemble tree like diagrams known as dendrograms. These channels are the basis for its scientific name – Dendrogramma. In 2014, the original specimens were described for the first time by a team of Danish scientists. One of the Danish scientists had been part of the 1986 voyage that discovered the specimens and later transported them to Copenhagen. The Danish team classified the creatures as belonging to their own unique taxonomic group. However, the researchers were unable to lend support to the claim with genetic evidence, due to the manner in which the specimens had been preserved. “Like forensics and in medicine, DNA has become an essential part of a modern zoologists’ toolkit,” says Dr Tim O’Hara, a senior curator at Museum Victoria in Melbourne. “Publishing a new phylum without actually showing how it was related to other animals through DNA was a very old-fashioned way of doing things. However in 2015, scientists aboard the Australian research vessel Investigator relocated the mushroom-shaped creatures. “It was a ‘eureka’ moment,” says Hugh MacIntosh, a senior research fellow at Museum Victoria who identified the creatures. In total, 85 specimens were collected from a depth of around 3km on the continental slope near South Australia. The specimens were stored in a solution that would enable the extraction of DNA. “We could suddenly get DNA and complete the picture, which is what we’ve done,” says Dr O’Hara, who led the genetic component of the research. The present paper is published this week in the journal Current Biology. The researchers said that the specimens belong to a class of floating jellyfish known as siphonophores, found along the Australian coast, and in the Indian and Pacific Oceans. The Portuguese man-of-war jellyfish, also known as a bluebottle, is considered part of the siphonophore class. Siphonophores are comprised of many polyps, which help in buoyancy, propulsion, gathering and eating food, reproducing, and fending off threats. They also have a mushroom-shaped organ called a bract, which can separate from the animal when it’s disturbed. O’Hara says the deep-sea mushroom is not an independent species, but a bract, which has been shed by a larger organism, and which lives for only a very short time afterwards. “We were a little bit disappointed,” he says. However, there is still one mystery that needs to be solved. The 2 cm sized mushroom-shaped caps are considerably larger than all the bract appendages of all known siphonophores, since most bracts are closer to 2mm wide. “We know it’s part of something. But what our actual animal looks like in real life is still a mystery,” he says.